Indian Premier League (IPL), the most exciting and famous cricket tournament in T20 format has begun. Cricket fans are so excited to catch the action live on televisions. Worldwide cricket fans who are suffering from the fever of IPL surely don’t want to miss a single ball of the tournament. It is really difficult to stay away from TV when their favorite team is battling for their glory. Here we come to help you as we bring the top 5 IPL app for iOS to stay tuned to IPL 6, which will keep track all the latest news, live scores and match schedules of IPL8 2015. Check out the list for best iPhone app for IPL. Let’s Download 5 best IPL app for iOS devices (iPhone, iPad or iPod). This is the official app of Board of Control for Cricket in India (BCCI) for iOS. BCCI official app for iOS devices will provide you with the live scores, news, match schedules, stat, standings and other relevant information for IPL 6 2013. The app also features videos, virtual replay, live commentary, photos and score updates of all matches. This is a very good app for iPhone or iPad to stay tuned with iPL 6. ESPN Cricinfo is one of the most all-time favorite app for cricket lovers. ESPN Cricinfo app for iOS offers live scores update of IPL 2013 with ball by ball commentary, live scores, latest news, rumor, match schedule, result. The app now also added two new features- video and audio podcasts. You can also keep updated with all major cricket leagues, international matches with this app. A must download free app for iPhone, iPad or iPod. Yahoo Cricket is yet another best iOS app to stay updated with Indian Premier League 2013. Best app to keep updated with live scores, match fixtures, partnership, batting lineup etc. Surely you will enjoy the cricket with Yahoo Cricket app for iOS devices. This is yet another awesome app for iOS device that provides you with quick score update and ball by ball text and audio commentary that helps you visualize all the action. You can get alert and provide all information and latest news about upcoming matches via push notifications of the app. A very simple yet effective iPhone app to follow iPL 6. 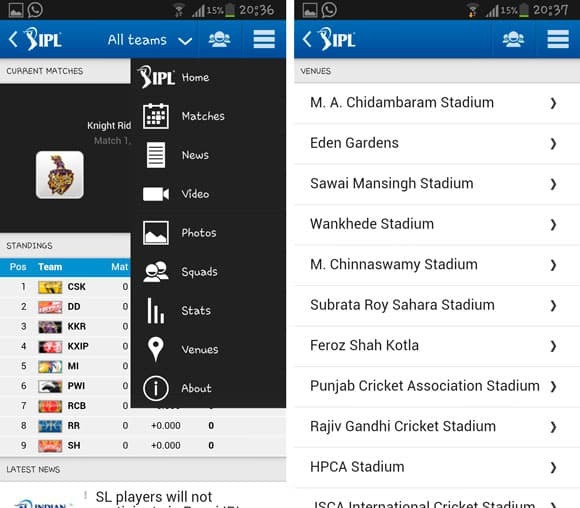 IPL 2015 Live Score app targeted to deliver Live Score very fast & accurate and it surely does what it should. The app haven’t got very good impression on the play store however it seems work fine. Give it a try and see if it worth keep on your device. These are the best iPhone and iPad apps in our review especially for IPL 2015. Please let us know if you choose any other apps.